Aged, yet distinctly sharp-lined and modern. Organic and naturally-grained, but colorfully manufactured. 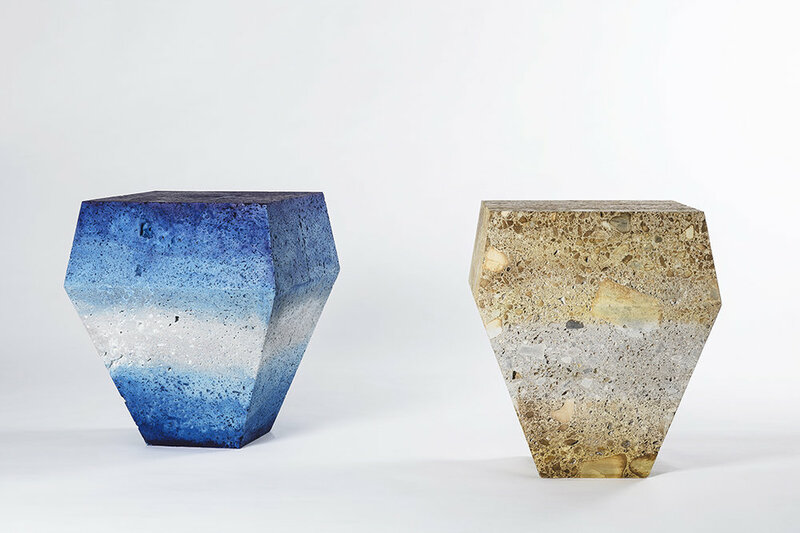 These contradictions add up to a pleasing whole in the form of Sophie Dries' Marble Shades–a series of interior objects carved monolithically from whole blocks of natural marble. The blocks–polygonal forms–are then dyed intensely, to imbue them with graded, bright hues. A collaboration between Paris-based architect and designer Sophie Dries, and the Belgian Marble company Van Den Weghe resulted in a chemical recipe patented by them, that allows a timeless and traditional material such as marble to be dyed and transformed deeply and intrinsically (not just stained superficially). Despite colors as stark as bright blues, oranges, and reds, this graded avatar of a centuries-old metamorphic rock feels authentic and natural. 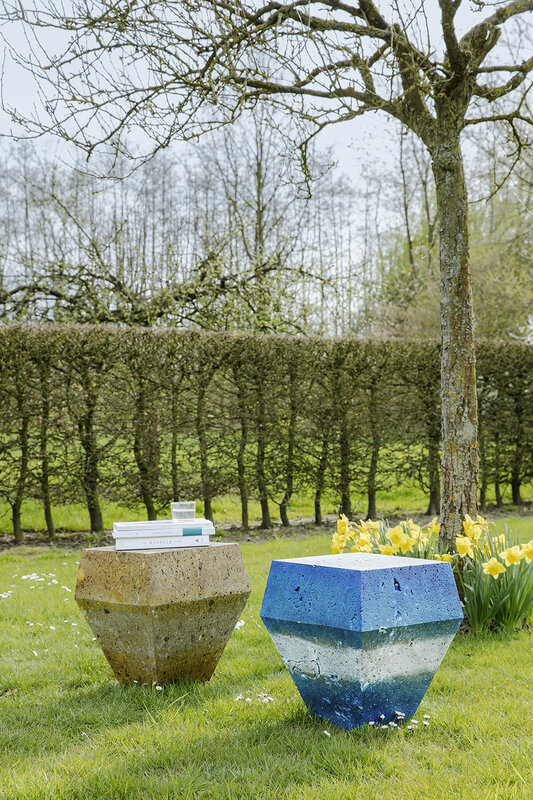 The fact that the injection of color isn't superficial, and will remain intact when the pieces are placed outdoors and over the course of time has perhaps something to do with it. As does the inspiration for Sophie's graded color infusion itself–the work of artist James Turell and his diffusive, colorful light sculptures. Choosing to infuse color onto, and edit the most luxurious and iconic varieties–Italian Marbles such as Travertino, Carrara, and Ceppostone (a truly Milanese Material)–does seem like a daunting and dangerous task, but Sophie seems to do it with taste, ease, and grace. The project-launched at Milan Design Week this year, and represents a partnership that we, at MaterialDriven, have been talking about and championing a great deal of late–that of the designer and manufacturer. A great deal of material innovation and a robust influx of fresh ideas into mainstream material supply can result from collaboration between a designer and a material manufacturer or supplier–as Sophie's Marble Shades project shows us. Working creatively with materials, textures, and forms, and generating unusual combinations of them isn't new to Dries, who has multiple collections of furniture and interior objects under her belt, in addition to prestigious architectural and interior design projects across Europe. Traces, an evolving and continuing series of works by her brings together carefully textured ceramics or concrete, with more polished but industrial looking metals. The textures of these works exhibit traces of their making process, paving the way for the name of the collection. To learn more about Sophie's works, do follow this link to her website and project collection.